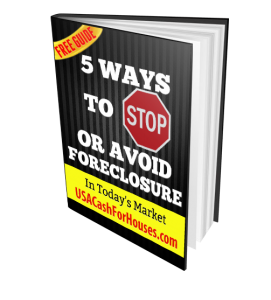 Get details on how to avoid foreclosure, put a stop to the foreclosure process, and discover the 5 basic foreclosure options available to you in this free guide. In the long run, foreclosure is something no one enjoys and may not end the way you would hope. However, when you have the right information, know your rights and all of the options available to you, you can make educated decisions and put together a plan to come out the foreclosure with as little long-term damage as possible. Download the Free Foreclosure Guide by filling out the form on the right. We will email you a pdf of the easy to understand guide – you can read through it at your convenience. You will also get other helpful tips from our Foreclosure Avoidance experts to help you make a well informed decision to provide the best possible outcome for you based on your specific situation.